You also need a willingness to participate in archaeology fieldwork. The core of the class is an excavation. Over the years we have dug at a variety of sites throughout the Hamline-Midway area – a church ruins, a segment of a Territorial road, Hamline’s original University Hall, and a number of ‘backyard’ sites associated with neighborhood houses. This year’s site is one of the ‘backyard’ sites – known as “830 Simpson Avenue“. This rather mundane name identifies the location of an early house in the Hamline neighborhood. We don’t yet know a lot about this house, but it shows up on local plat maps dated to 1886. By 1916 Hamline University purchased this house, moving it across Hewitt Avenue in 1946 where it was eventually demolished. 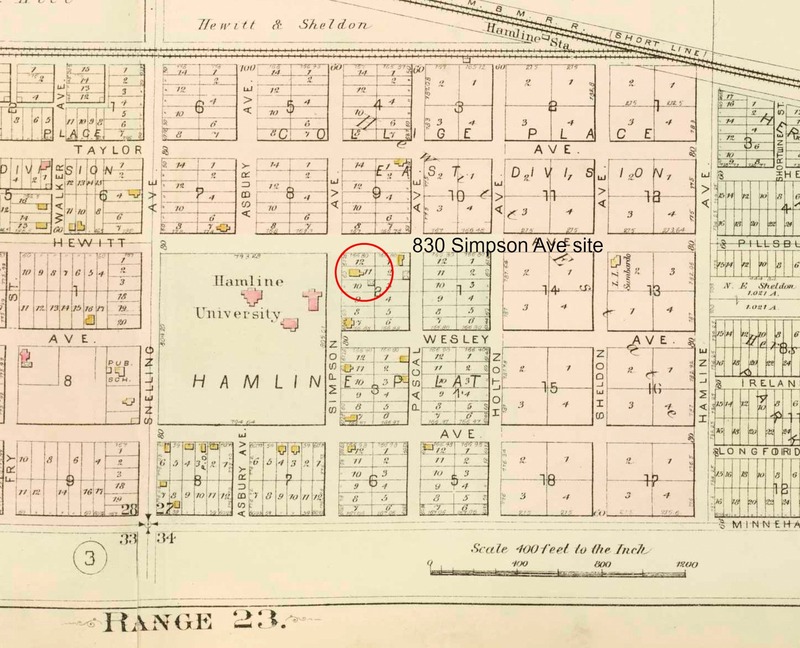 Plat map published in 1886 showing the Hamline neighborhood including the 830 Simpson Ave site. Yellow boxes are wood frame houses. We first began excavating at the 830 Simpson site in 2013 finding a wide range of artifacts dating to the late 19th Century including fragments of bone toothbrushes, clay smoking pipes, and shell buttons. We also found artifacts that belong to the 20th Century occupation of the house including objects most likely associated with student residents such as a metal case filled with lead graphite points for a mechanical pencil. More important than the artifacts, the soils containing these objects were essentially undisturbed beyond the effects of the prior occupations – meaning that 830 Simpson Avenue site is one of the better preserved archaeological sites on Hamline campus. The University administration designated the site as an outdoor classroom reserved for our future excavations and I expect that we will be digging here for a number of years. Our research will focus on issues surrounding the transformations in American society during the period of occupation – transformations in consumerism, education, family structure, and urban development. We will also explore issues of neighborhood history and preservation – including the relationships between campus and our surrounding community. Was there a “stop the demolition” movement in 1914? What happens to a neighborhood when houses are removed? What happens to neighborhood history? What happens to local memory? I think that our excavations at the 830 Simpson site will provide a vehicle for our exploration of many issues, both big and small, that affect people living in the 21st Century. So, I’m looking for a group of students that are willing to work hard – no matter the conditions (we dig even when its cold, wet, and muddy). You have to commit to helping with at least one of two Saturday digs when the public can join our excavations (one near the end of September, the second in mid October). Otherwise the qualities I most want are students who are creative, ready for a challenge, and who would enjoy a non-traditional educational experience. If this sounds interesting then write a brief comment to this post outlining what ways you could contribute to this fall’s class. Also tell me a little bit about yourself (including your major and year). Finally, I would like to know why you are interested in joining the class and what you hope to gain from your participation. I am very interested in joining “Excavating Hamline History” this coming fall semester. I have always been deeply interested in Hamline University History, I just applied to be the director of the Hamline Historic Tour through the Hamline Student Alumni Board of which I am an active member. I am also interested in the history of the larger Hamline community (my favorite thing is looking at old photographs with a group of people from the Hamline Elders group). I also have been following the communities reactions to Hamline University’s expansion plans rather closely, attending community meetings whenever I get the chance. Given that I am interested in history (specifically Hamline history), I am involved with alumni (through SAB), I have been involved in community events (like meeting with the Hamline Elders and attending community meetings), and that I am a social scientist always excited to conduct research, I feel as though I would be a good contributor to this class. I am double majoring in Communication Studies (with an emphasis in media studies) and Sociology (with an interest specifically in historic sociology) and going into my junior year in the fall I feel as though I have had a wide range of experiences that would make me a wonderful asset to this class. My contribution could range anywhere from outreach to community members and alumni, applying my sociological perspective, or providing a historic perspective and a guarantee a high level of enthusiasm! Hi! My name is Chloe McElmury and I am currently a freshman. My major isn’t 100% decided, because I might be creating a flexible curriculum major. However, I know I want to concentrate on graphic design, web design, and some business. When I saw this class was being offered, I got really excited. When I was younger, I wanted to be an archaeologist (among many other things). I loved digging holes in the backyard and playing in the dirt! Since then, I have kept an interest in history and pieces of the past. As a native Minnesotan, I think it would be very interesting to learn about the history of a piece of my own state. I think I could contribute to this fall’s class in a way involving social media, as that is what I’d like to work with in a career one day. Whether that’s starting an Instagram or Facebook page for our class, I think it’d be a good outlet to be creative yet informative while getting the public involved in what we are doing. I hope to gain some new insight on my home here at Hamline and it’s history. I would also hope and like to improve my teamwork and group skills. I think this would enrich my life culturally and academically. I’m really excited about the dig and hope to join! My name is Michael Everett; I’m a sophomore with junior credit standing majoring in History and Political Science. I’ve loved history going back to my earliest days in school, the same goes for politics but that’s a story for another time. My family’s story goes back to before the Revolution in the United States, and I grew up with a few stories from the American Revolution: including one of a British Officer who led the only battle in Delaware. Now that means they fought for the “wrong” side but having that personal connection to such a defining war in history was incredibly special, to the point that I “rooted” for the British in my 2nd grade history class. This eventually led to my aunt and me working on digging deeper into family history in our spare time…she did more research than I did but I got the basic gist of it. I’ve always loved the history of the educational institutions I’ve attended. I was fortunate enough to attend Minnehaha Academy from preschool to twelfth grade. It was at Minnehaha that I came to love not just the subject of history but the history of the school, and this translated to Hamline as well. I came here right after the White House was demolished. Within my first week on campus I met a few community members who wanted to save the rest of the housing stock from the expansion. I led a small group of students who wanted to save the houses. We collected 250 signatures in support of saving the houses and converting them to honors housing; I ended up at the 100 who Influence dinner my freshman year for this work. Just last semester I completed Historical Methodology, where I wrote a research paper on Congregationalism and its influence on early American democracy. I’ve also worked on a variety of research projects for my internships at Medica and the Minnesota Senate. I think this would be a great educational opportunity to put my academic studies into the field. I’m a junior sociology major and nonprofit management minor interested in this class. I’ve always lived in the Twin Cities, so I’m especially interested in this project. The excavation project this year offers many opportunities to research with a sociological lens, which is exciting for me! My first thoughts are how interesting it would be to research the demographics of the original houses’ neighborhood, and its new neighborhood, and whether that affected the houses fate. Why was the house sold to Hamline, and who were the people who owned it originally? Did the original owner(s) belong to an oppressed group, and did their affiliations affect how the house was ultimately sold? What was Hamline’s purpose of moving it across Hewitt Avenue, and how did it impact the neighborhood’s demographics and wellbeing? I’m interested in seeing if gentrification played a role in the house’s history, or other sociological cultural events in the two houses’ neighborhoods. The objects in the house remains itself could lend clues about key sociological trends impacting the house and its owners. What were the roles of social institutions at that time, such as family, government, or religion? These institutions could make themselves known through familial artifacts like scrapbooks or pictures, legal documents, or holy artifacts. The objects in the house will affect which institutions I may research further, and in what way, but I will use a sociological method. It will be better to pick methods once I am better educated on the proper archeology techniques in researching an excavation site. The questions I pose could be researched by studying US Census archives, interviewing elderly midway neighbors, and searching for related Hamline documents. I’m excited for the prospect of researching Hamline history. Thanks for reading. One of the reasons I made the decision to attend Hamline a few years ago, was because it seemed like a university that valued the preservation of old campus buildings (GLC) and the history of the neighborhood. This of course was before the demolition of the White House and several of the homes across the street, but I digress. Even if the structures themselves are not there anymore, it’s incredibly important to put time into the excavation and researching of artifacts located on these plots of land. It’s in these artifacts that we are offered a window into the lives of the people who lived there, and the things that made our community what it is today. I am very interested and excited to have the opportunity to possibly participate in a course that would allow me to quite literally dig up pieces of history in hopes of reaching a better understanding of both our school’s, and the surrounding neighborhood’s past. My name is Olivia and I am a triple English, History, and Musical Arts Major. I will be a junior at Hamline next fall. Primarily I like to focus on social history and the stories that people, or the objects they once owned have to tell. This past fall semester I took the Historical Methods course, and it allowed me the opportunity to do research at the MN Historical Society Library in St. Paul. My topic dealt with child labor in Minnesota in the early 1900s, and through my research I was able to look at a wide variety of primary sources that supported my research. I looked at everything from portraits, journals, commissioner reports and workers permits, to giant scrolls of orders given by inspectors, court orders, and even a couple pamphlets from the National Child Labor Committee: ‘Child Labor Sunday’ awareness day program. After spending a semester digging into the archives, I am excited to apply my research skills to help find supporting evidences/background on the items we discover on the dig. As I am currently a resident of a house that was moved to its current location after the construction of the freeway, I am also very interested in how the removal, and/or relocation of houses affect neighborhoods. I attended a non-traditional high school where we were out in the community doing projects every month that dealt with the implications and effects of environmental change on the community. If given the opportunity to participate in this course, I look forward to integrating my passion for history as I get back to working in the field. Any of my friends can tell you that I am very nostalgic and interested in old artifacts and history in general. I barely listen to “new music” and when I do it’s only because the oldies stations I listen to normally aren’t playing anything good. At home I mostly only listen to vinyl records- yes, I have a record player. I also have collected several artifacts I have found over the years including old oil cans, a boat oar, license plates, “Exit” signs, and ice skates, most of which are believed to pre-date the mid 1930s. I even go as far to drive old cars. Collectible cars though, not just a ’92 Honda Accord. I don’t know how to describe it and I have difficulty attempting to do so when people who don’t understand why I like the things I like ask, but there’s just something about old artifacts that I like. They intrigue me. Not only do they look cool, there is a history behind them. The license plates I have were found on the garage (built around the 1910’s) wall with years on them from 1926 and 1930. My mother asked why I was saving them when we were cleaning out the garage for it to be torn down. All i could think of to respond was they were cool, but in reality there’s more to it. I think about the fact that someone, almost 100 years ago, bought a new car which they kept in that same garage until they sold the car. Maybe it was their pride and joy. Maybe it was just a old junker car. I’ll never really know, and that alone adds to the value of the items to me. I am currently a sophomore, will be a junior in the fall, with an intended major of Legal Studies and minors of Business Analytics and Business Practice. Something that I could bring to an excavation project, especially since the site is at the location of a house that Hamline bought and later moved before tearing down, could be a discovery and understanding of the legal process that the university had to go through to do so. Things were different and there probably weren’t as many hoops they had to go through at the time to accomplish this. What had to be done though? Is there anything filed in the city archives about the process. As far as why I want to take Excavating Hamline in the fall, the class just intrigues me. One of my roommates was talking about the class which I hadn’t even heard of until then (maybe a week ago). I looked into it and have been really interested. I still need both of my natural science classes that are required for graduation from Hamline. I haven’t looked into taking them yet because the typical science classes of chemistry, physics, biology don’t appeal to me. Furthermore, the few interesting classes to me always fill up right away so as a non-science major, it has been difficult to get into anything I would actually enjoy. This class, because of the application structure for signing up, is something that I could actually get into. I am genuinely excited for the class and look forward to hopefully being selected for it. I just realized that by commenting from my account, you probably don’t have my name. Alex Udulutch. My name is Avery Marshall and I am currently a first year student with sophomore status. As of last Friday, I am officially majoring in Anthropology! I am eager for the possibility to join “Excavating Hamline History” in fall of 2016. Although I am leaning towards focusing on sociocultural anthropology studies within my major, I am looking forward to expanding my knowledge and experience of archaeology. This past fall, I was in Professor Skip Messenger’s Ancient Maya course and attended many Minnesota Maya Society events. Hearing the fieldwork stories and dig processes from various anthropologists was fascinating. I enjoyed how they related their physical finds to their overall research and in turn, found new aspects of the society being studied. I look forward to that possibility here at Hamline! Social and power structures are very engaging topics for me, so I would love to understand how they relate to the Hamline community of the past as well as the present. Outside of my academic studies, I enjoy learning about environmental and agricultural issues which I think would be an interesting aspect to consider with this dig. Participating in this dig would not only help better understand my studies, but the Hamline community and history as well. I am thrilled at the possibility of getting my hands dirty with this engaging learning opportunity! Hello! I am an Anthropology and Political science double major. Within anthropology, my focus is cultural. As I have yet to have a chance to participate in an excavation, I am particularly excited to take this course! Furthermore, the opportunity to engage in a meaningful way with my local community is priceless, and I would be a fool to not participate. If accepted to this class, I would like to do my fieldwork on the actual excavation itself. What is it about the past that interests people, both for the public community who comes to participate, and for students like myself? Starting with this base question, and using collaborative ethnographic field methods I will examine how this particular excavation resonates with the larger Hamline-Midway community in light of the current political tensions between the University and the community on housing. The final product of this will be either a series of short semi fictional stories (but still ethnographically valid :D! ), or a more formal fieldwork write up. I look forward to hearing your response! Hello! My name is Angel Arevalo. I am currently a Junior, but hoping to graduate in the fall of 2016. I am a Criminal Justice major with hopes of one day becoming a Homicide Detective. I have taken an anthropology course and at one point considered majoring in Anthropology. I have always been interested in discovering the meaning of different artifacts and their history, in relation to their time period. I also work for Hamline University Safety and Security and have had access to many parts of Hamline that not everyone gets to see. I am fascinated with the history behind this campus and the discoveries people have made. I love exploring and would love to be a part of a Hamline discovery. With the future goal of becoming a Homicide Detective, I have learned the proper ways to investigate and preserve a variety of “evidence”. I believe that I can contribute to this class in many ways, while coming from a different perspective due to my choice of major. For instance, I can identify different areas on the property where foot traffic would be the heaviest, and therefore remnants may remain. Also, I have the knowledge of using different legal programs and libraries to research criminal activity done by a person or at a specific place. I thrive when it comes to hands-on learning and I am sure to bring a lot of enthusiasm to this class! I’m an anthropology major with a focus in archaeology and biological anthropology (bones and mummies are the best), and a possible forensic science minor. I’m currently a sophomore and will be a junior in the fall. One way I would be able to contribute to this course is participating in the dig. I’ll be taking the topics in archaeology course alongside this one and it would be amazing to be able to take what I learn from both that course and this one and apply that knowledge to an actual dig. I’d also be interested in helping with interviewing and collecting information from people within the neighborhood if that is needed to help further our understanding and research. I’ve enjoyed digging up artifacts from the past since I was little while visiting the farm my grandmother and her siblings grew up on. From broken mason jars to old newspaper clipping, it was always fun to try to figure out the past and always of great interest to me. Being able to have the opportunity to take this course will further my knowledge on just how all the work is done, will give me great background knowledge and a solid foundation for the future, and will allow me to find out more about the neighborhood I currently live in and that has an impact on the university and vice versa. I’d like to take this course because it is of immense interest to me and sounds like an amazing class to be a part of. I am a sophomore with high junior status at Hamline University and I was extremely interested in joining your class. I am an English/Anthropology double major who was interested in doing more hands-on work in the field of anthropology. Ever since I was little I knew that I liked people, whether that was interacting with them or learning about them in school. Despite social circumstances my interest in understanding people only expanded as my ability to communicate with others vastly improved. The biggest thing, though, that lead me to the subject was my wanting of knowledge, as there really isn’t one area of academics that I like more than the other. The great thing about anthropology is that it involves different kinds of topics and disciplines, anywhere from biology and forensics to sociology and linguistics. As I am halfway through my time at Hamline, I understand that in order to get the major every field should be studied in, and I am thrilled at the opportunity to do so. I have already delved into prehistory, but I have yet to learn much about more recent archaeological remains, and I feel as though it would be beneficial to start participating in more field work, as there is only so much you can learn from textbooks. By being apart of this class, I hope to gain new knowledge in this area of archaeology, as well as get opportunities to work with other people and expand my interaction out in the field. I would be able to bring not only my knowledge of the past through my literary background but also the plethora of ways to conduct group work through multiple anthropological classes. I also have a wide range of abilities involving social media sites and overall communication with people. What makes anthropology great is that despite each sub-field having its differences, the connection between them is the construct of what is human. While I have mostly been exposed to the digital side of anthropology, I hope that expanding into the other fields will give me not only an outlook on my future in the field, but also my future in working with other people to strive for a common goal. I’m ready to take the next step forward in my academics, and I hope that step is being in your class. Hello everyone! My name is Seth Bobrow, and I am currently a sophomore at Hamline who is majoring in secondary education and social studies with a minor in psychology and anthropology! I love music, theater cinema and science! I played Action in West Side Story and I used to be in a barbershop quartet! My goal in life is to be a social studies educator that inspires students to not only work hard, but work their hardest because I believe one of the most prolific things an educator can do is exceed student, parent and staff expectations of what they believe are the limits of student capability. I have been inspired by past educators who have pushed products out of me that surprised myself and the people around me which is why I am extremely interested in this class. I am not very familiar with anthropological work but I believe that learning about the actual field work would give me great experience to incorporate something like this into my own lesson plans if I were to teach anthropology. This class would be something I would like to pass on to my own students someday as something that gets them actively involved in a fun way and producing actual scholarly work that may challenge their expectations. My personal interest would be on the more science heavy side, perhaps gaining knowledge about the chemical makeup of the soil or artifacts found at the site, but my expertise lie in education where I could set up an archeological dig for a class (age range k-12) and gain valuable experience in both education and anthropology. I am a hard worker and a critical scholar so I would LOVE to learn the science behind making deductions about artifacts. I can’t lie and say I have a passion for archeology yet since this would be my first class in the subject, but I do have a burning interest to get into a hands on collaborative process that can inform me in valuable ways for my educative career as well as expose myself to a science that has been peaking my curiosity since the class was suggested to me by Sue Myster. I would love to be a part of this class and contribute whatever I can with all of my best effort. I am going to be a senior this fall, and am majoring in anthropology with a course focus in archaeology. I have taken the Lab Techniques in Archaeology class, participated in the Hamline Field School, and taken Applied Archaeology. This summer I will be working for the US Fish and Wildlife Service in addition to working on summer collaborative research with Professor Hoffman. I believe my background knowledge of archaeology will allow me to be helpful resource in the field for the other members of this course. There are many reasons why I love archaeology. Though it’s sometimes frustrating to look at a decrepit, rusty piece of metal desperately trying to figure out what it even is, the moments when it clicks and suddenly makes sense are incredibly satisfying. As an organized person, I appreciate the meticulous documentation that goes into keeping track of artifacts and their provenience. I enjoy being outside with my hands in the dirt, and I can even be grateful for the little bit of soreness that comes from squatting, shoveling, and sifting all day because it means I wasn’t sitting in an office all day. But most of all, I just find material culture fascinating. I like thinking about the way things are made, their uses, their possible value, their distinctness, and all the other aspects that go into interpretation. I like to think about the ways objects change, whether by intentionally being made into something new, or by simply breaking down. I am excited to be a part of this class next year–I think it’s not only a great opportunity to work with artifacts, but also to work with the Hamline-Midway community and hopefully build up more community interest in archaeology and Hamline history. I will be a senior this fall majoring in anthropology with a concentration in archaeology. I have taken Lab Techniques in Archaeology along with Applied Archaeology, and last summer I participated in Hamline’s Archaeology Field School. I have also received the opportunity to work in the archaeology lab at Hamline. My experience in archaeology in the field and in the lab may be helpful in assisting other members of the class who have little experience in using and understanding fundamental archaeological field and lab methods. While I have received opportunities to learn archaeological lab and field methods, I haven’t had as much experience in the lab working with historical artifacts. I feel that this course will be a great opportunity to learn how to engage the public with archaeology. The work we do in the Hamline-Midway neighborhood may further articulate the local memory of neighborhood and create a stronger sense of place for the community members who live here. Hi everyone! My name is Alexa Hanson and I am going to be one of your TA’s this semester! I am a super senior this year. I transferred to Hamline from North Dakota State in 2014. One of the first classes I took here at Hamline was the lab techniques class with Brian, where I learned that this is what I want to do for the rest of my life. I participated in last summer’s field school where we did work at the Lindbergh house in Little Falls, Jeffers and Plum Island. I’ve taken the applied archaeology course and principles of archaeology course, which means that I know a lot about all elements of archaeology and am willing to answer any questions you guys may have. I am currently Hamline’s zooarchaeology collections manager and one of the lab supervisors. I’m also currently working on an independent study analyzing the faunal and lithic assemblages from Kiska Island. All of this basically means if you ever need to find me for any reason I’m probably in the lab. I love archaeology. I love finding cool things that show the history of a place and I think this course is a great opportunity to give people that experience. It’s also a great way to get the community involved in what we do and help them understand a little bit more about their community. I hope to be a valuable resource for you guys, so don’t be afraid to ask me any questions! Hello, I am Virginia Block and I will be a senior in the 2016-2017 academic year! I am majoring in Political Science with a minor in History. Local history has always been a particular interest of mine, as I grew up near Little Falls, Minnesota, near the home of Charles Lindbergh. As I continued on through my education, that love of finding out about the history of the home I love so much only grew. When I came to Hamline, one of the major selling points was that connection to the history of the area and to the community that has been built here. As a History minor, I recently completed a Historical Methods class, in which I focused on local history, specifically Polish immigrant populations that settled in rural areas of Minnesota. Through this research, I have become well acquainted with the Minnesota Historical Society and am comfortable sorting through archives and analyzing primary sources for information. I also work at the elementary school and am familiar with many of the faces of the people who work there. I have a connection with the students and would love to find a way to have them help get more involved in building a stronger connection to the history of their home. Finally, I have always been enamored with getting into the hands-on work of history, specifically archaeology. From the first time I watched Dr. Zahi Hawass speak about Egyptian ruins in my beloved National Geographic documentaries, I have been compelled to seek out the history all around me. Most recently, that has taken me all the way to Morocco where I have spent an entire day walking around the Roman/Berber ruins of Volubilis/Walili. I would love to take the experience I’ve had here and bring it home to help discover more about the Hamline area. Hello, My name is Megan and I am currently a junior planning to graduate in Winter 2017. With Fall 2016 being my last full semester here at Hamline, I am looking to take classes that expand my experience as much as possible. Although I am not an Anthropology major, and instead study Public Health Sciences and Sociology, this dig sounds fascinating and like a great way to wrap up my college career. Public Health is extremely broad in scope, and with this I have found a passion for gaining experience in different fields and “getting my feet wet” in many different areas. I know Anthropology doesn’t have much to do with Public Health, but I think I could bring new perspectives to the table with this background. This past J term I studied abroad in Italy with a music course here at Hamline. While abroad we visited Rome, and one of my favorite parts was visiting the Collosseum and Ancient Rome. We spent an entire day going through and analyzing the rich history. Going through the excavation of Ancient Rome was fascinating, leaving me with a desire to learn more about excavation and Anthropology in general. I think this course would allow me to expand my knowledge in a new way that I probably wouldn’t otherwise. I am excited for what this can bring for me, and for what I can bring to it. My name is Mariah Zastrow and I am a History major here at Hamline University, and I will be a senior next year. Prior to being a history major, I was studying Anthropology/Archaeology and found it incredibly interesting. I was fortunate enough to participate in a field school where I was exposed to surveying, excavations, lab work, analysis, and some public history, which has encouraged me to look at my studies within history in a completely new way. My exposure to anthropology and archaeology has been nothing but beneficial to many aspects of my life, and I would love to have the opportunity to participate in this environment once more before I graduate. Not only would it be nice to engage and brush up on some things I have already learned, but I feel that this class is specifically applicable to my major and possible work that I will be involved in after I graduate in the spring of 2017. With that being said, I would like to contribute to this class by doing historical research, both academically and publicly. I have a lot of experience in historical research, but I would also like to use this opportunity to participate in some public history and involve the community. This class is extremely unique in that it is taking students from all different areas of study, and using their strengths and experience to form a collaborative group working towards a cohesive outcome. To be able to participate in something like this is invaluable, and I would so grateful to be chosen. Hi there! My name is Todd Pitman, and I am a transfer student in my junior year at Hamline. My major is in the Digital Media Arts department, and my skills include web design, graphic design, photography, videography, and writing copy for the web. I would love to contribute my expertise to the Excavating Hamline History class, in whatever capacity it might be useful. If we need an outreach video to bring the community into the fold, I can help with shooting and editing that. If we need a web-based tour of our site, or an online document of our findings, I’d love to help create that. I love making works that bring together various media and disciplines in a single, cohesive object, and I think this could be a fascinating project to bring documentary photo, video, and audio into a rich multimedia project rooted in good, fundamentally-sound aesthetics — artifacts beget artifacts. This course is of particular interest to me as a St. Paul native, looking to explore a bit of my hometown’s history first-hand. I’m fascinated by unearthing the past, and hope to learn a lot about archaeology and how a dig functions. I admire patient processes, and hope to bring some archaeological discipline into my own work, while hopefully bringing a different approach as a Digital Media Arts major. My name is Joe Dailey and I will be a senior at Hamline this fall. I am currently a History major and I am also pursuing my Paralegal Certification. I am currently enrolled in University Honors at Hamline as well. I’m interested in taking this class for a variety of reasons. Outside of needing a science class for graduation, this class seemed a lot more interesting in terms of its scope and originality. I’ve never taken a class like this before nor have I taken any Anthropology course. I do love History very much though and I plan to pursue my Ph.D in history after graduating from Hamline. The historical aspect of this type of class is what is most interesting to me. The experience in this class would help my future education in Graduate School as well as the work force. I work well with others and I have collaborated on projects before in Legal Studies and English courses. I feel I could learn a great deal from this class and also be an asset in helping others learn. I’m grateful for the opportunity to register for this class. I look forward to hearing from you. Hi, my name is Mickaela O’Malley. I am currently a junior and will be a senior fall 2016. I am a psychology major with education minor in hopes of becoming a special education teacher. I am from Omaha Ne and currently on the gymnastics team at Hamline. I am creative and a super hard worker, which I would bring to the class. I am always up for a challenge! I would bring to the class my willingness to work hard and my creativeness. I am interested in this class because I don’t know much about Hamline’s history being from Nebraska. With the digs I will be able to further my education about Hamline and it is a way to broaden my knowledge of its history through anthropology. I am excited for the more hands on learning, which is how I hope to be running my classroom one day. I am really excited for the upcoming year with hopes to be in your class! I am an anthropology major with a focus on biological anthropology. I will be a senior in the fall and am interested in taking Excavating Hamline for multiple reasons. First, I would like to acquire a more rounded experience in anthropology by learning more about methods and practice in archaeology. I have previously done two internships working with the artifacts of archaeological digs, but these were done in a museum collections context rather than a lab or excavation context. I will be concurrently taking Dave Tennessen’s archaeology class, so this would provide a varied experience that I would benefit from greatly. Second, I have interacted with this project during Museum Anthropology, designing exhibits based on the artifacts previous incarnations of this class have uncovered. I would love to be a part of both sides of this process. Learning as much as I did from Museums, I am so excited to learn from the actual excavation. Third, I really appreciate the idea and intention behind this project. The University is a part of the neighborhood and effects decisions and change on the wider community. And yet there can easily be a barrier between the university and the neighborhood, so projects such as this, that integrate the two, are really valuable. It creates an opportunity for dialogue. In terms of what I bring to the project, I have a great deal of experience and enthusiasm for lab work (though that experience is not archaeological). I love forms, documentation, and data. I am excited to dig and learn more about the history of the neighborhood, with the history as a potential reflection of the present. After the actually archaeology of the class, the interaction of the past and the present in Midway is the topic I am most drawn to (ie, housing and their destruction). I would love to participate in the open excavations, as educating the public about what anthropology and archaeology actually are is something I’m very excited about. What we do, as a discipline, should be accessible and benefit the wider public. Hello, my name is Rob Lane, I am going to be a senior next year and would very much be interested in taking this class. I am a history major, and this excavation is right up my alley. One of the factors that got me interested in being a history major was that as a hobby I like to do research on various buildings I find interesting in the twin cities and have been doing so since I was in high school. I frequently write down the address of an old building I see and like and later see what I can find out about it. I have lived in the Como/Midway area my whole life and am very comfortable with collecting any information I can from locals and I honestly enjoy listening to people’s recollections of areas and events and I also enjoy trying to figure out what places may have looked like in the past. I also spent the first 3 years out of high school digging holes for basement apartment drainage pipes and operating a jackhammer, so I am not opposed to any amount of long, cold outdoors work. I would really like to be involved in this in any way I can help. I love the Hamline area and would love to help unearth some of the past here, even if it just means getting materials from archives or hauling wheelbarrows of dirt. As an anthropology major with a focus in biological anthropology, I am extremely interested to take this class and expand my abilities in the field, gaining new insight and experience when it comes to the work. As a sophomore with some field work experience and the hopes of a summer internship with the American Anthropological Association, I think I could really grow from this class. Not only do I find the class itself to be a great opportunity, but also a chance to learn more about the neighborhoods that surround us, maybe even finding parallels between the relationship of the school and those living around it bot in the past and present.It seems like a great chance to take part in more hands on learning, rather than just sitting in a classroom and taking notes for the entirety. I always have the willingness to learn and the drive that will allow me to learn quickly and enjoyment of all aspects of the work, no matter it be lab work, field work, documentation, etc.. Discovering more about the area that surrounds us may provide us with invaluable information about what it was like here, and may even be used by the public in informative and educational ways. Thank you for the opportunity to join this class and I hope to take part in the fall! I am going to be a senior at Hamline in the fall and am currently studying abroad in Graz, Austria. I am majoring in cultural anthropology and minoring in religion and am fascinated by this course topic. I have not taken an excavation class before, nor do I have much experience, but I know this course will interest me most because of the hands on working environment that is provided. I am intrigued by what we have the ability to find during our excavation and I look forward to understanding the cultural and contextual significance of our neighborhood surrounding Hamline. Last year, I participated in the visual anthropology course and so enjoyed getting to know the Hamline midway community and working with various neighbors throughout our film making experience. I have stayed in touch with a few neighbors I worked with last year and it has been a great way to better understand our community. I would love to be in this class and learn together and work to better understand the history of our area. I am thankful for this unique opportunity at Hamline to take this course and I hope you consider me to be a part of this experience. My name is Martin, and I will be a junior this fall. I am double majoring in anthropology with a focus in archaeology, as well as history. Although they are separate disciplines, I see history and anthropology as being closely linked. By studying the material remains of a culture, we are able to better understand their history in ways that might have been lost, or never catalogued in the written record. Historians need to have physical evidence of the past, and this is achieved through archaeological excavation. Similarly, the work of archaeologists is framed by the historical record, especially in an environment like the Hamline-Midway Community where there are documented records that will better help us interpret what we find. I would love to be a part of this class to gain more experience with the technical aspects of excavation, as well as to become more comfortable working in the lab. I have some experience working on digs, and have taken applied archaeology, and I see this class as an opportunity to further refine my skills and knowledge. As someone who grew up in St. Paul, this class will also help me learn more about the community that I was raised in, and in turn how to preserve the past so that future generations can know the rich history of their neighborhoods. I’m going to be a junior this fall majoring in anthropology and minoring in religion. I have been extremely excited to take this class since I first heard about it when I was touring Hamline as a prospective student. I have been patiently waiting until I finally had a chance to take this class. I have already participated in a volunteer dig at Fish Creek with Jeremy Nienow so I can definitely contribute to class because I have a little background knowledge on how digs are done. I had so much fun helping out in that dig that I’d love to get more experience! I can definitely be a great asset to class because of my background with the other fields of Anthropology. I also have connections with members of the local community that I’m sure would love to help out in our class! I also have experience in creating ethnography videos so I can record our digs and findings. We could present our findings to the community via videos that would be interesting for everyone! I am interested in joining this class so that I can finally decide if I want to be an archaeologist or socio-cultural anthropologist, it’s so hard to choose! I hope to use this class in order to broaden my experiences as an anthropologist at Hamline. I hope to see you in the fall! My name’s Cory Quirk and I’m an anthropology major with a biology minor. I’m starting my third year at Hamline in the fall. My interest in anthropology comes from the interdisciplinary nature of it, and the way it aims to acknowledge the complexity of individuals and their societies. In the rest of my time at Hamline I’m looking to potentially complete a certificate of proficiency in Spanish as well. In the past, other fields I’ve been interested in are environmental studies and history. I’m enthusiastic about the opportunity to participate in digs around our campus since I haven’t taken an archaeology lab class yet. I just began volunteering in the archaeology lab a little over a month ago. I love hands-on work and I love working outside whether it’s in the sun, the wind, or the rain. I don’t know if I can the same about -10ºF weather but I try to go by the old adage that there’s no bad weather, just bad clothing. So far this semester I’ve been working with volunteers for Professor Davies’ visual anthropology class, like a couple other folks who have posted here. That has taught me about the Hamline-Midway neighborhood and collaborative community anthropology in a way that I wouldn’t learn from in just a classroom setting. I’ve been able to see how public interest surrounding anthropology can be garnered through conversation about complex issues in the neighborhood and how they affect individuals. The couple who I’ve been making films with has a century-old map of the Midway neighborhood in their house–I know they as well as many other people in the neighborhood must have some interest in the history of the material culture of their neighborhood. In the case of the visual anthropology class, the methods involve a lot of filming and interviewing, but I look forward to see how to get the public involved with archaeological work as well. My name is Logan Micek, and I’m currently pursuing a major in Criminology and Criminal Justice here at Hamline. This class interests me because it gives me a glimpse into Hamline’s history, something I’ve always wished I knew more about. Taking a more hands-on approach through this class would hopefully lead me to gaining a greater understanding of the goings-on throughout the history of the university. I’m currently the Hamline Undergraduate Student Congress President-elect, and a part of the history of the university that hugely interests me is what hot topics were of years past. Things like the “Stop the demolitions” movement weigh heavy on students’ minds, and it’d be interesting to see what previous generations of Hamline students cared about. While I’ve never taken any archaeology or anthropology courses in the past, the experience I have with Criminology and Criminal Justice could still prove useful in the class. I’ve learned about the importance of proper preservation due to the delicate nature of evidence, and I’ve had to examine the history of punishment and corrections to formulate my own opinion on what works and what doesn’t. What mattered in society 100 years ago I believe is still valuable in evaluating things that matter now. Hello! My name is Taylor Hanson and I will be a junior this upcoming year, graduating a year early, so this will be my last year. I am majoring in legal studies and minoring in political science. I am very interested in taking this class and was excited to hear that there is no particular experience required to take this class. I believe this class will be a great way to introduce me into the field of anthropology and to explore my interests in that area. The out-of classroom education experience will help really engage me into this field. My interest and curiosity in anthropology sparked when, in my political science classes, I read articles about how anthropology is used to better understand political culture, ritual, politics of a society, conflict resolution and ethnography among other things. This made me realize that the only way to fully understand something would be to study not only the present, but the past, origin, and development of societies. Since I am majoring in legal studies and my interest is in law, I would love to examine “legal anthropology” to get a better understanding of the founding concept of law. I would be able to contribute to this falls class by examining it through a legal studies and political science perspective. I will ask questions such as “how is law present in cultures” and “how did it manifest”? I hope that by studying the past and present, I can better understand today’s current culture, laws, and politics. I also think the overall community would be very interested in seeing how culture, laws and politics evolved and how it came to be. I really hope I get the amazing chance to take this class and explore my sparked interest of anthropology. Since this is my last year, I would hate to miss the chance to explore my curiosity in anthropology and finally learn about that field. If chosen, I hope to take what I have learned from this class and apply it to my fields of study, political science and legal studies. I also hope that this class will lead me to take other anthropology courses the following semester. I really hope you consider me for this class, as I am very interested and excited about taking this course! My name is Gabe Atkins, and I am a senior here at Hamline. My major is Environmental Studies with a concentration in Anthropology. I was made aware of this class through a previous professor of mine who explained the general goals and activities of the class, which peaked my interest. I currently work for the Department of Natural Resources on a seasonal basis when I am not in school, doing fish contaminant research and fieldwork, so this class experience would be right up my alley. If selected, I would be able to contribute my manual skills as well as my research and data keeping skills to the further the project. I also love collaborating and working with others that can contribute skills that I do not possess in order to achieve something that I could not on my own. I have had multiple classes at Hamline in the Anthropology department that take a look at excavations that other people have done, but I have never participated in one myself or witnessed the process first hand. I love learning about the past through artifacts and objects of previous occupants of an area. One of my favorite hobbies is going to garage sales and estate sales to find old items that once belonged to someone else, and trying to put a story together of how it came to be in the owners possession and how they used the object. Being that I am a bit older and a non-traditional student, I have had a different state of mind toward education since returning, appreciating that there are options such as this class and would relish the opportunity to experience and excavation for myself and participate in an actual “dig”. Thank you for your time, and take care! Hi there! My name is Molly Ryan and I am going into my junior year at Hamline. This course initially sparked my curiosity when I saw the term ‘excavation’ because I had not heard of any course like this before. After looking into the details, I began to realize that the style of this course would accommodate to my non-traditional learning style. I learn best by participating in hands-on activity, surrounded by others. I believe that my ability to work well with others, my positive attitude and natural curiosity of the world would make me an asset to this course. I am majoring in Communications and would be very interested in exploring the connections between my major and the artifacts that we find. 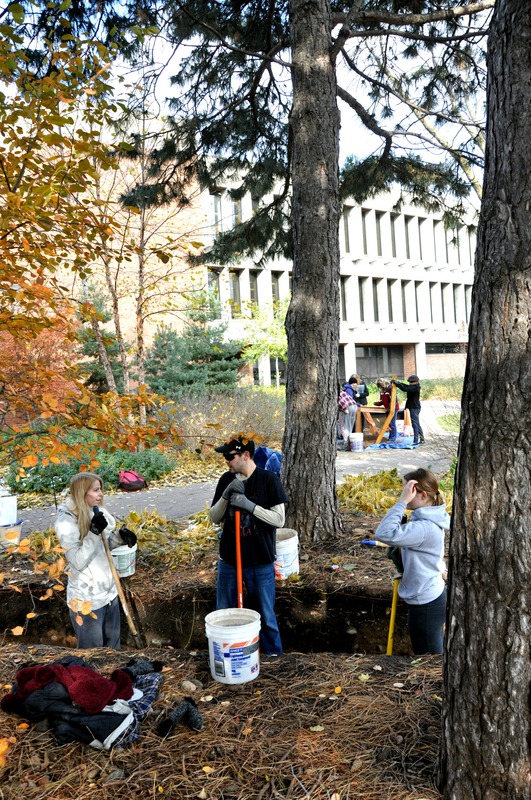 I am intrigued by the concept of gaining insight into the history of Hamline’s community through excavation. After taking this course I would hope to have a solid understanding of how to decipher the stories that artifacts tell. I am a double major in history and education. I am a junior this year. I plan on going the the Masters program here at Hanline for education. I am the co-founder of Hamline synchronized swimming club here on campus. Which has me working with different people to have a fully functional team. I think experiencing a more hands on class will give me a well rounded classs experience here at Hamline. I also think that this will help me as a future teacher to have more hands on experience for my students and to have them learning more about the communities in which they learn in. I think the part I can contribute the this class is my education major and helping the students from the Hamline elementary school join our class and learn with us. Also teaching them a bit more about the community. I am excited to learn more about the community I have lived in the past 3 years.